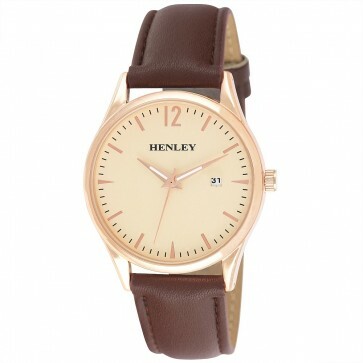 The Henley Mens H02164 is a smart, modern and stylish watch with the added bonus of the calendar function. Set in a polished round case the H02164 has a minimal sand dial with stick index and stylish sword hands. The H02164 is a really good looking piece and is set to do very well in 2018. A must for your collection! Polished Classic Case - 39mm. Sand Dial with Calendar Function and Colour Co-ordinated Index. Colour Co-ordinated Sword Hands with White Infill.